Oliver Lielegusually has little to do with bricks, mortar and concrete. As a professor of biomechanics at the Institute of Medical Engineering (IMETUM) and the Department of Mechanical Engineering, he mainly deals with biopolymer-based hydrogels or, to put it bluntly, slime formed by living organisms. During a conversation with a colleague at TUM, Lieleg came up with the idea of using biofilms to alter the properties of construction materials. Professor Christian Große holds the Chair of Non-destructive Testing. Among other things, he investigates self-healing concrete whose cracks close autonomously. One variant of this concrete contains added bacteria. Activated by the ingress of moisture, the bacteria close the cracks with metabolic products containing calcium. For his own project, Lieleg used mortar instead of concrete. Instead of mending cracks after damage has occurred, he wants to prevent moisture from penetrating into mortar in the first place. Such invading water can cause serious problems, for example by inducing the growth of mold or widening existing microcracks through freeze-thaw-cycles. To prevent such water ingress, he takes advantage of the fact that some bacterial films are highly water-repellent. In the journal Advanced Materials, Lieleg and his colleagues describe how to make a moisture-resistant hybrid mortar. The key ingredient in the new material is biofilm produced by the bacterium Bacillus subtilis. “Bacillus subtilis normally lives in soil and is very common microorganism,” Oliver Lieleg explains. “For our experiments, we used a simple laboratory strain that grows rapidly, forms plenty of biomass and is completely harmless.” Lieleg’s team bred the bacterial film on standard culture media in the lab. They then added the moist biofilm to the mortar powder. In the generated hybrid mortar, water was significantly less able to wet the surface compared to untreated mortar. To evaluate this surface property, the scientists measured the contact angle between water droplets and the surface. The steeper this angle, the more spherical the drops are, and the less likely the liquid is soaked into the material. Whereas this angle is only 30 degrees or less on untreated mortar, it is three times as high for drops on the hybrid mortar. Water droplets on polytetrafluoroethylene, better known by the trade name “Teflon”, have a similarly high contact angle. 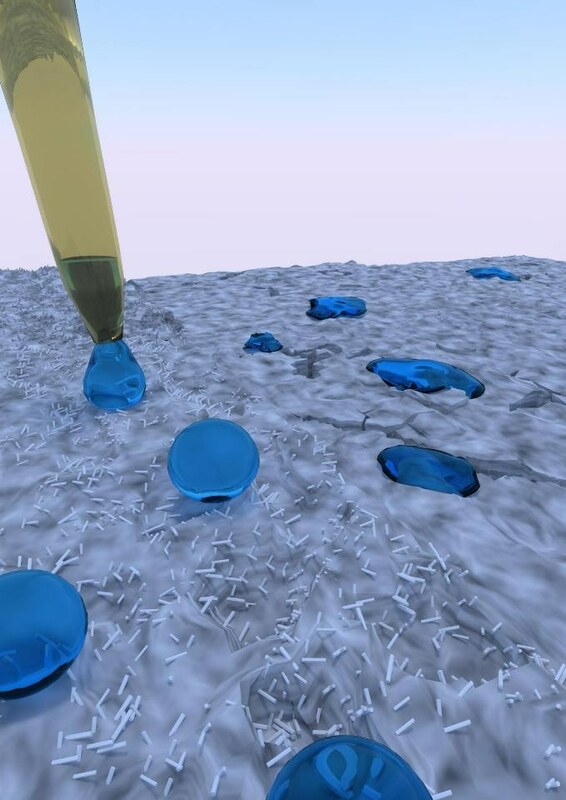 An explanation for the water-repellent properties of the hybrid mortar can be found in electron microscope images: The surface is covered with tiny crystalline spikes. This results in what is known as the lotus effect, which also occurs on the leaves of the lotus plant. The small uniform structures on the surface ensure that only a small part of a water droplet is actually in contact with the leaf surface. The surface tension of the droplet therefor is stronger than the forces that make it adhere to the leaf. Consequently, the droplet easily rolls off the leaf when the leaf is tilted. A cross-section of hybrid mortar shows that crystalline spikes are not only evenly distributed on the mortar surface but can also be found throughout the bulk volume of the mortar. This reduces the capillary forces that are normally responsible for the uprise of water in mortar when the material is immersed into liquid. Although similar spikes also occur on untreated mortar, they are too long, rare and scattered for the lotus effect to occur. The researchers assume that the added biofilm stimulates uniform crystal growth throughout the volume of the hybrid material. To find out if the hybrid mortar is resistant enough to actually be used in construction applications, it is currently undergoing mechanical tests in Christian Grosse’s department. “If the mortar is in fact suitable, there should be no problem for companies to produce it on a large scale,” Oliver Lieleg says. Both the bacterial strain used and the culture media are standard and relatively inexpensive. “We‘ve also discovered in our experiments that freeze-dried biofilm can be used equally well. Then, in a powder form, the biological material can be stored, transported and addedmuch more easily .” In the future, the scientists want to examine whether the biofilm can also be used to protect concrete against water.